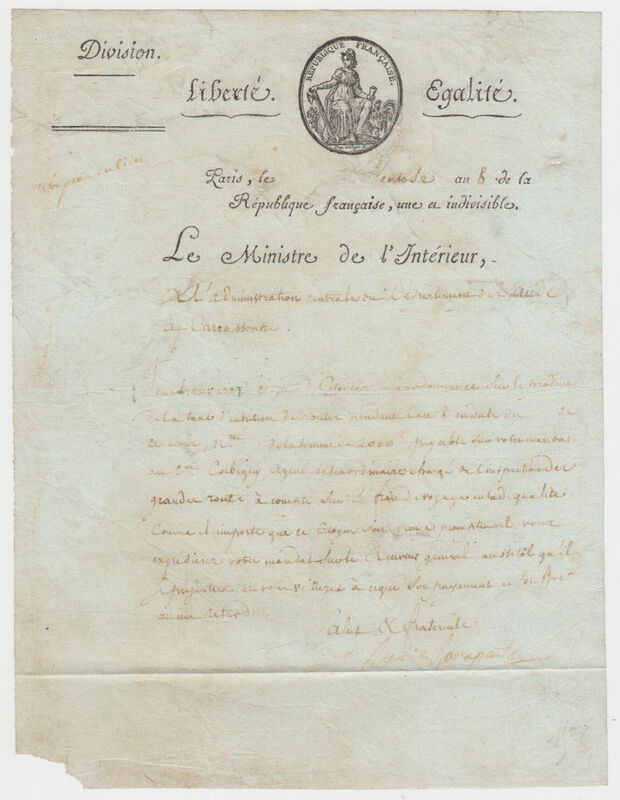 Letter Signed ‘Lucien Bonaparte’ as Minister of the Interior, addressed to the Land Department at Carcassonne, ordering the payment of 2000 francs to Citizen Corbigny, “agent extraordinaire charge de l’inspection des grandes routes”. In French. 1 page 9 x 7 inches, Some staining and fading, small piece torn from lower left corner. Printed heading. Paris, 26 February 1800. With faults, but sold as an uncommon autograph. Lucien Bonaparte, Prince Français, Prince of Canino and Musignano (1775 – 1840), the third surviving son of Carlo Bonaparte and his wife Letizia Ramolino, and a younger brother of Napoleon.